As Site Director for the FOCUS Program at Camp Lejeune, I have had the pleasure of working with many military families, who often share that winter months can be particularly challenging. School breaks can disrupt the family routine, cold weather can make regular outdoor family activities difficult, and the aftermath of the holiday rush can leave families feeling exhausted and drained. In addition, many families are faced with the deployment of a spouse and parent, which can compound an already stressful time of year. Finding ways to spend quality time together indoors can help families work through winter boredom. You may ask, “What can we do inside besides play video games?” The answer may seem simple and a bit old-fashioned: PLAY! As we grow up, we often get the message that play is a frivolous activity, something children do during their free time and something adults simply don’t have time for. Yet did you know that play is much more than fun? Play is the way children express their feelings, develop problem-solving skills, learn healthy social skills, and communicate with others. By taking a few minutes each day to play with your children, you are helping to facilitate their healthy development in all of these areas. This is no small task! Make a Plan. Schedule in playtime, even if it is only five minutes a day. Life can be hectic, and it is easy to get caught up with day-to-day chores and obligations. Taking a moment out of your day to enjoy your children can be rejuvenating for you, as well as a wonderful opportunity to strengthen your relationship with your children. Follow your child’s lead. Allow your children to take the lead in the play and give them the space to be creative. It is okay if they aren’t playing with a toy the same way you would. Allow them to show you their “new way”, and praise them for being thoughtful and innovative. Be engaged. Playing WITH your children is quite different than simply observing your children playing from the kitchen while also attending to many other tasks. It can be helpful to sit next to them, make eye contact, reflect their words and activities, and show genuine interest in what they are doing. For instance, if your children are building with Lego bricks, comment on what you see-- “Oh, I see you are building a house.” By commenting on your child’s activities, you are showing them that you are interested in both what they are doing and how they go about it. Go Slowly. It is okay to show children how a toy works or how different pieces go together, but try to hold off on doing it for them every time. Children are natural problem solvers, and giving them an opportunity to figure things out can help them build confidence. Read your child’s signals. Sometimes children get frustrated during play because they can’t get things to work the way they want. Older children will often express this verbally. Younger children may not be able to tell you in words when they’ve had enough or are frustrated, but they can let you know what they need in other ways, like using sounds, facial expressions, and gestures. For all age groups, it can be helpful to acknowledge their feelings, such as saying, “I see you’re feeling frustrated that the block won’t stay put on top of your tower.” Reflecting a child’s feelings does two important things: It helps them learn to identify and label their own feelings. It communicates to them that you understand and care about their feelings. Create a friendly play space. You want to set playtime up for success. Find a space where your children can play freely without too many “no”, “stop”, and “don’t” reactions from you. Is it child-friendly and child-safe? Are there too many distractions, or too much noise? Is it a good space for the activity you’ve chosen (e.g. painting, throwing balls, etc.)? If the answer to all of these questions is yes, it may allow you to focus more on the activity than safety or other concerns. This will help you to follow your children’s lead more freely. Expect repetitive play in younger children. Although doing the same thing over and over again may not be much fun for parents, it is extremely exciting for young children! Children practice in order to master new challenges, and when a child can do it “all by myself!”, she is rewarded with a powerful sense of competence. The more children practice and master new skills, the more likely they are to take on new challenges in the future. Play isn’t just for toddlers! Learning and expressing feelings through play doesn’t end when a child goes to elementary school. Even older children and teens benefit from family play time. Use the same principles described above, but adapt the activities to your child’s developmental level. Rule of thumb? Let them choose. Whether it is a new board game, creative art activity, or even a discussion about a book your child is reading, following their lead and showing interest lets them know you care--and fosters family bonding. I hope this gives you helpful tips for planning some family fun during this cold and wet season. To get more great ideas for family-friendly activities, check out this edition’s “For Those in the Know”, which highlights several creative indoor activities for the whole family, in addition to a website containing great resources for moms and dads. You can also check out our other articles Double Duty Rainy Day Activities, Tips for Tackling Common Family Challenges and FOCUS on…Time Marking. Have a warm and safe winter!. Day to day, season to season, parents can find themselves facing any number of challenges. From developing a routine to increasing communication with your children, here are three common challenges and tips to face them head on. Deployments can be hard for children, so parents often look for ways to support them by keeping connections strong during times of separation. Part of what makes deployment difficult for younger children is that, often, they have trouble understanding time. For instance, even though a child may know that his parent will be gone for nine months, he may frequently ask when mom or dad will return home. In addition, simply looking at the total number of days on a calendar may be overwhelming to some children. Time marking is a great tool to help strengthen connections, chunk deployments into manageable timeframes, and keep track of time during deployment. What is time marking? Time marking is a simple way for children to break down and measure the time from the beginning to the end of a time period. The goal of time marking is to provide a concrete way to visually track the passage of time. It also includes a routine or ritual that the child can enjoy with the family members at home. The time marking activity can be tailored to a child’s specific interests and the caregiver’s available resources. This special month of celebration was established to underscore the important role children play in the Armed Forces Community. 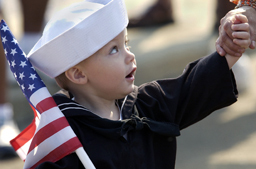 To learn more about the Month of the Military Child and some fun activities you can do to celebrate it please visit www.monthofthemilitarychild.com. 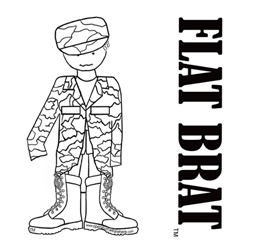 Brat Town Bugle™, a downloadable newspaper template, was developed by Benita Koeman, founder of Operation We Are Here, to help bridge the gap between kids on the home front and their geographically separated parent. When Benita's husband returned to the U.S. for R&R, their family went on a ten-day action-packed vacation and built a wealth of family memories. However, when Benita’s husband returned to Afghanistan, she became aware of all the family experiences he was missing out on. She noticed that her children were not good at sharing these experiences by phone or in journal form. On May 21, 2009, the Defense Centers of Excellence for Psychological Health and Traumatic Brain Injury (DCoE) launched a public awareness campaign to encourage help-seeking behavior among service members and veterans with invisible wounds, called the Real Warriors Campaign. The website features articles and resources, as well as video interviews with service members, their families, and others dealing with psychological health or traumatic brain injuries. Looking for a great way to spend time together and reconnect after a deployment? Applications are now open for March 2011 Operation Purple Family Retreats. Want to give your kids a chance to bond with other military children and spend time in the great outdoors? Applications will be opening soon for 2011 Operation Purple Camps. You will need to work quickly as the application period is typically only open for about a month.